Installed on my 2014 CBR1000RR. Simple installation, no problems. For spools, they work great. For sliders, I hope to never find out how they perform. Works great and looks good. And great as a slider also. I'll be buying another set. Very large sliders/stand spools. They work great with my stands and are seriously heavy duty. They come with great hardware too, very sturdy! Advantages: Oversize, loads of meat on them, nice hardware. Disadvantages: None that I can see! Not much can be said, they're spools. 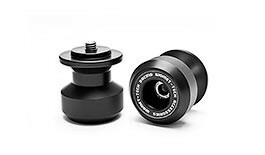 I'd like to only use them when using my rear stand but they feel like they'll definitely do the job should they ever need to serve their purpose as a slider also. Really nice spools. Nice having a slider and a spool in 1. They're quit large so i feel like they're easier to throw a stand on them compared to other spools I've seen. They also stick out a ways so i think they would protect fairly well in the event of a slide.